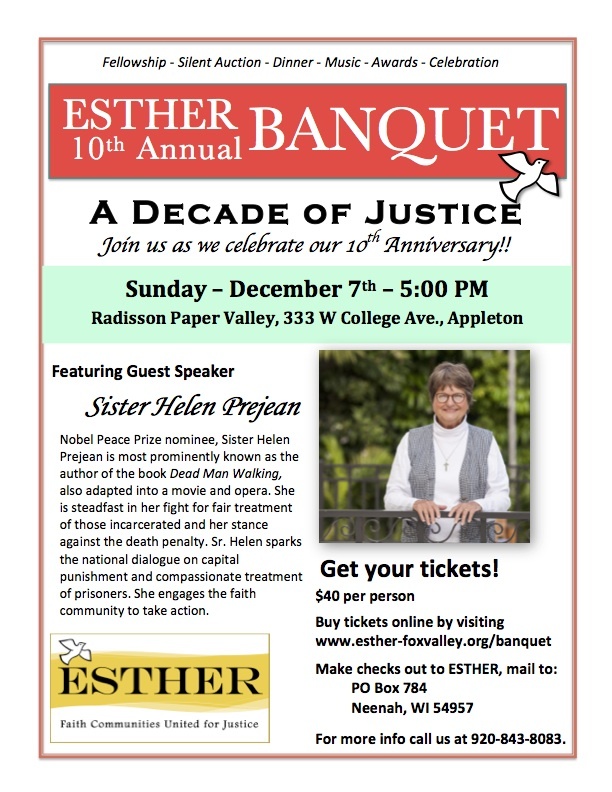 Posted on Dec 1, 2014 by Appleton Downtown Inc.
ESTHER Banquet - A Decade of Justice is December 7th at the Radisson Paper Valley Hotel. Nobel Peace Prize nominee, Sister Helen Prejean is most prominently known as the author of the book Dead Man Walking, also adapted into a movie and opera. She is steadfast in her fight for fair treatment of those incarcerated and her stance against the death penalty. Sr. Helen sparks the national dialogue on capital punishment and compassionate treatment of prisoners. She engages the faith community to take action. For more info call ESTHER at 920-843-8083.